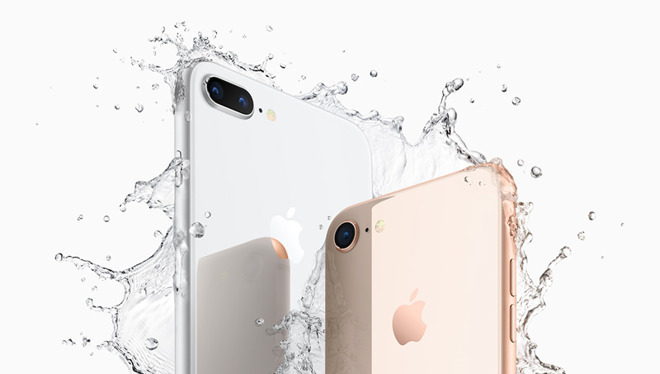 Together the iPhone 8 and iPhone 8 Plus amounted to 44 percent of U.S. iPhone sales in the March quarter, and even individually beat out the iPhone X —but Apple's historical performance versus what the survey company has said in the past about sales casts a pallor on the data. The $699 iPhone 8 took home 23 percent of sales, while the $799 8 Plus managed 21 percent, said Consumer Intelligence Research Partners. The $999 iPhone X allegedly managed just 16 percent, despite flagship features like an edge-to-edge OLED screen and Face ID. "We now have a full quarter of results for all of Apple's new iPhones," wrote CIRP co-founder Josh Lowitz. "Together they account for a smaller share of total sales than the newest phones did this time last year." In the December quarter CIRP still ranked the iPhone 8 family of devices about the iPhone X, and had the iPhone 8 outselling the iPhone X individually. But, that wasn't correct, according to Apple CEO Tim Cook. In February, Cook said that the iPhone X had been the best-selling iPhone every week since its November launch, through the December quarter, and all the way up to the day of the quarterly earnings announcement on Feb. 1. Those statements pointed to worldwide performance though, not just the U.S.
CIRP said that sales of the iPhone 6s and iPhone 7 remained relatively strong, and that the iPhone SE rose quarter-over-quarter to 8 percent. A "weighted" average retail price for iPhones, described as a "proxy" of Apple's average selling price that it reports quarterly, slid from $766 to $746. Apple's actual average selling price for the holiday quarter was $796, and the metric historically drops in the first calendar quarter of the year. so a predicted decline isn't a big surprise. "With eight models available, and the newest ones costing close to $1,000, consumers appear to want older, cheaper models that have many of the same features," argued another CIRP co-founder, Mike Levin. CIRP based its findings on its survey of 500 U.S.-based Apple customers that purchased an iPhone, iPad, or Mac between January 1 and March 31, 2018.